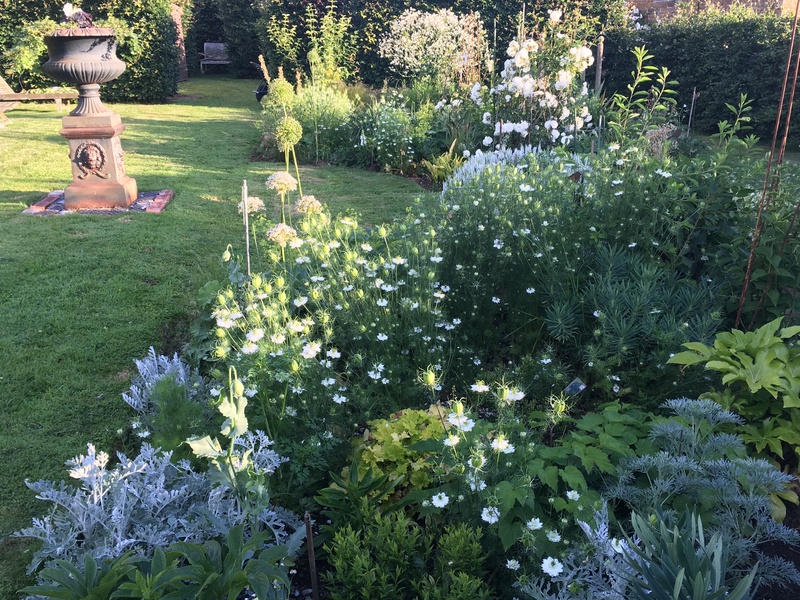 The White, Green and Grey Garden is looking as if it has been in place for many years, but in fact is only 20 months old. I couldn’t be happier with it, although it is an ever-changing thing which can always be tinkered with and improved. I cast a beady eye over it most days, planning and scheming and am never 100% happy with what I see…. not least if a rogue has self-seeded which is not in the prescribed colour scheme. 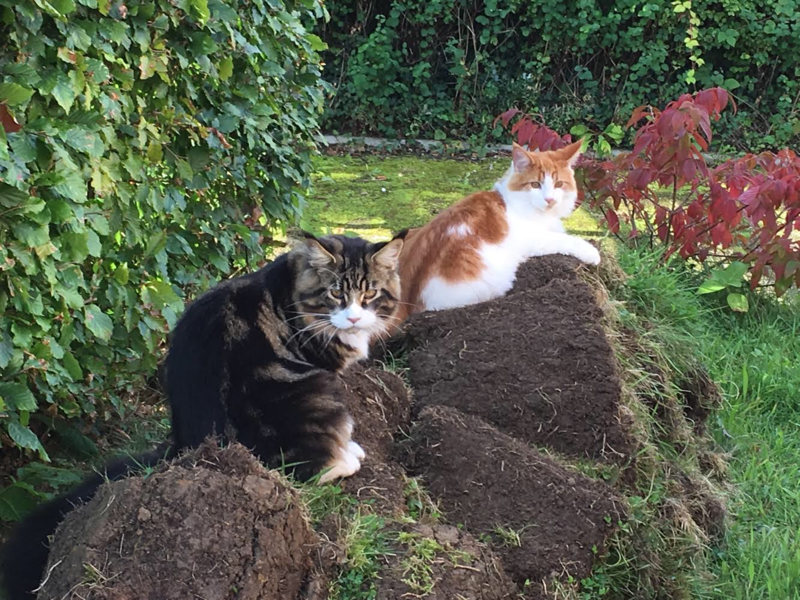 One unsolicited, uninvited pink poppy…..
Last month I decided to take a look at my turf stack, which we made from all the grass we had to remove in order to make both beds. A turf stack is supposed to be laid grass-facing-grass in a stack of neat sandwiches. 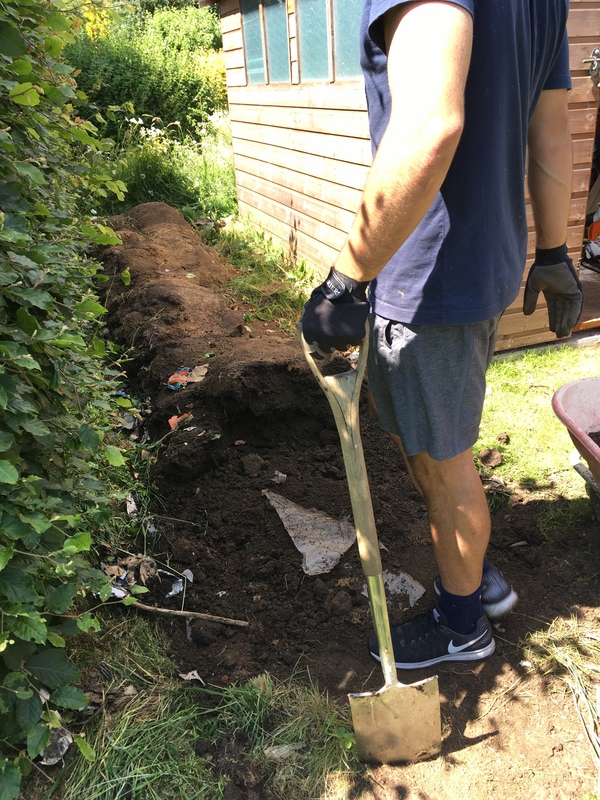 As you can see from the picture below, on the weekend we did the turf-removal, we were so shattered after using the machine to take it all up it I was happy to have it in any kind of system at all, so it was pretty much slung together willy-nilly in a straight-ish line. 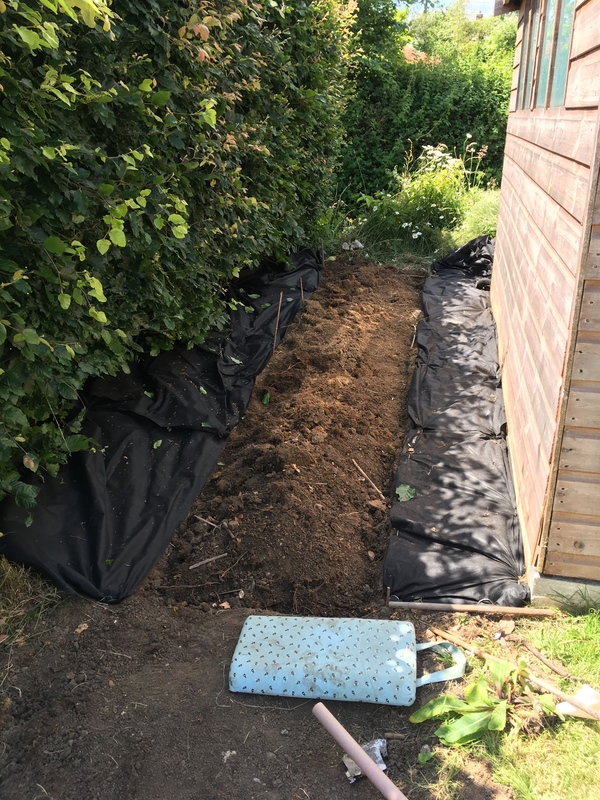 Despite that, it has been gently rotting down for the 20 months under plastic and black weed control fabric. 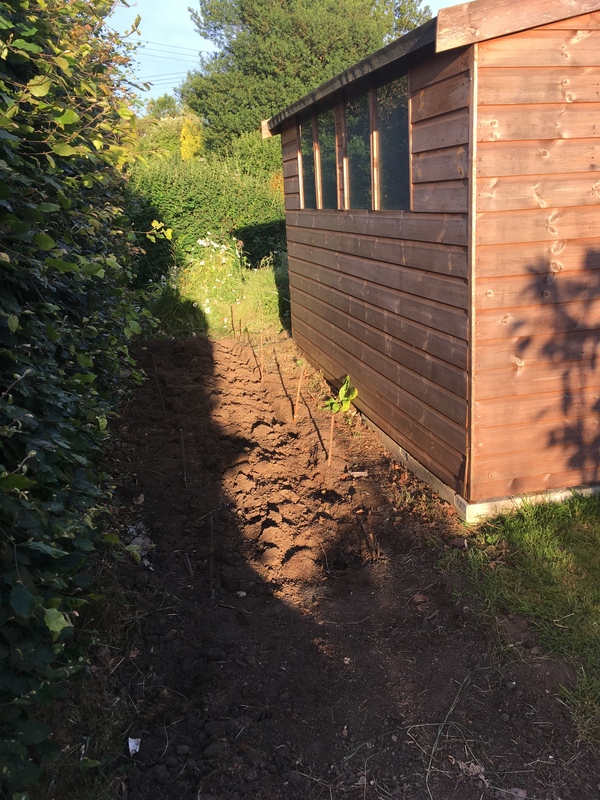 I have looked at it a couple of times over that period, but didn’t feel it was well-rotted enough to risk putting back onto the garden; the thought of reintroducing creeping buttercup and other nasties back into the garden made me very cautious indeed so I had to call on some often elusive patience…. 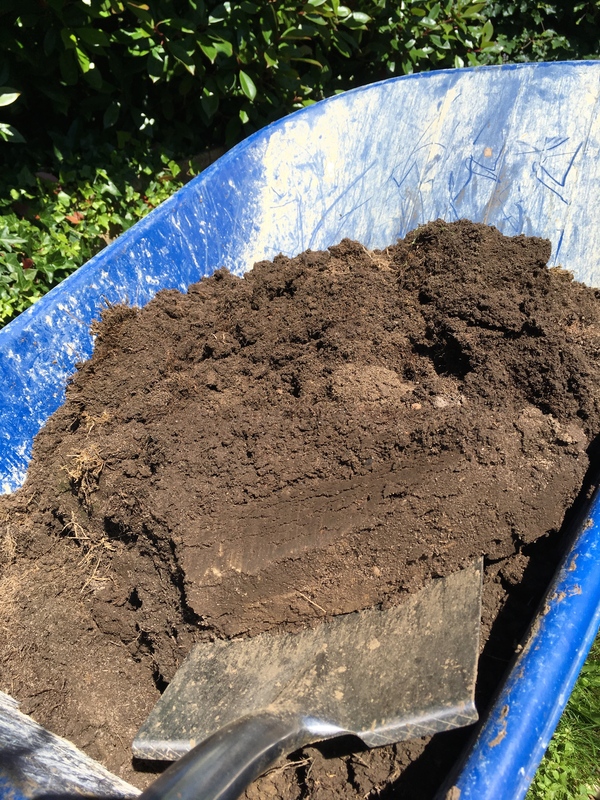 This time though (mid-June 2018), despite it being rather dry under there (no doubt I should have soaked it prior to putting it under its duvet) it looked very promising. Luckily for me my nephew was staying for a few days; he plays rugby for Wales, so quite literally can’t be any fitter or stronger and was happy to lend a helping hand, so we unwrapped the entire stack to see what we were dealing with. I was slightly nervous of vermin/snakes etc, but other than a huge number of ants (which had built some impressive nests, but equally had helped to break the turves down), quite a few worms (there no doubt would have been more if it had been damper) plus 3 rather startled toads, there was nothing to worry about. 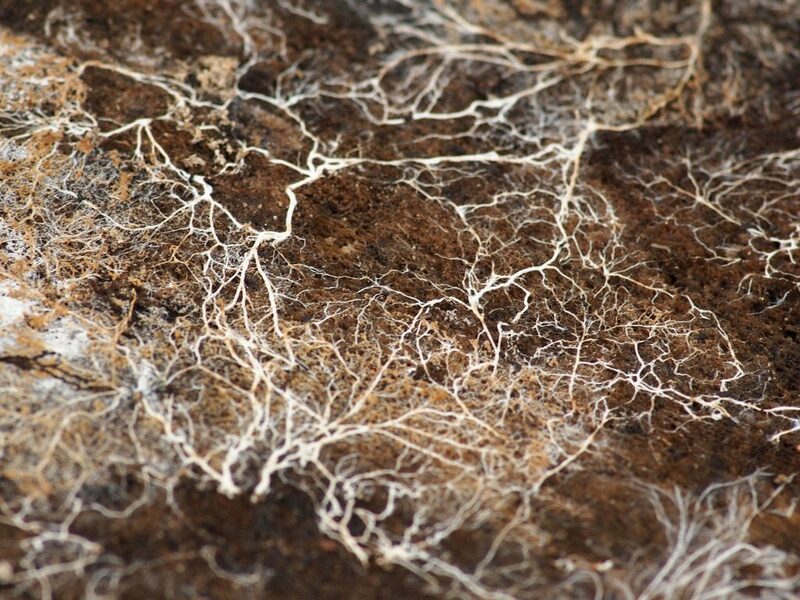 The other bonus was that, due to the inclusion of some very woody roots (that area of the garden had, some decades ago, been home to an orchard, where I am told the local village children would sometimes come and play), there were also a few very impressive pockets of mycorrhizal fungi, which look like very thin white veins and are very good for soil health. I believe it aids plants in taking up beneficial nutrients. There is more info on it here. 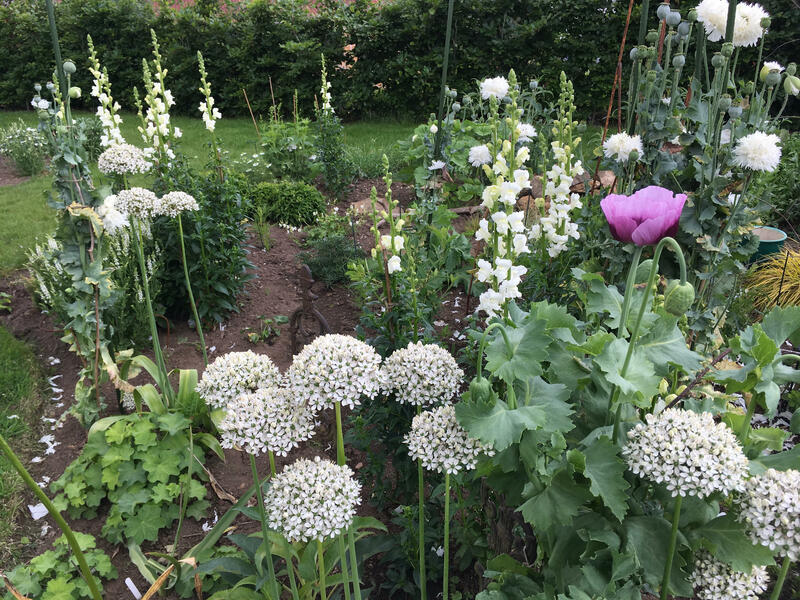 Joe gallantly helped wheelbarrow the first third of the stack before he had to leave, but that got me started, and many hours later the entire stack had been redistributed into the cutting garden, and back onto the two borders, from whence it came. There were probably between 25 and 30 wheelbarrow-loads in total. Recycling at its best. Some of it looked good enough to eat – rather like a luxurious chocolate cake. I could practically hear the garden singing as I laid it on in a very thick mulch. The birds absolutely loved chucking it everywhere and eating the ants and fat ant eggs, and I felt like a bountiful patron. Amazingly when I originally drew up the plans for the White, Green and Grey Garden, I had thought seriously about putting all the turf in a skip. Thank goodness I came to my senses. a fertile soil of clay and sand containing humus. GEOLOGY :a soil with roughly equal proportions of sand, silt, and clay. A week or so later, the birds are still throwing it off the raised beds which make up the cutting garden, joyfully searching for any overlooked goodies. 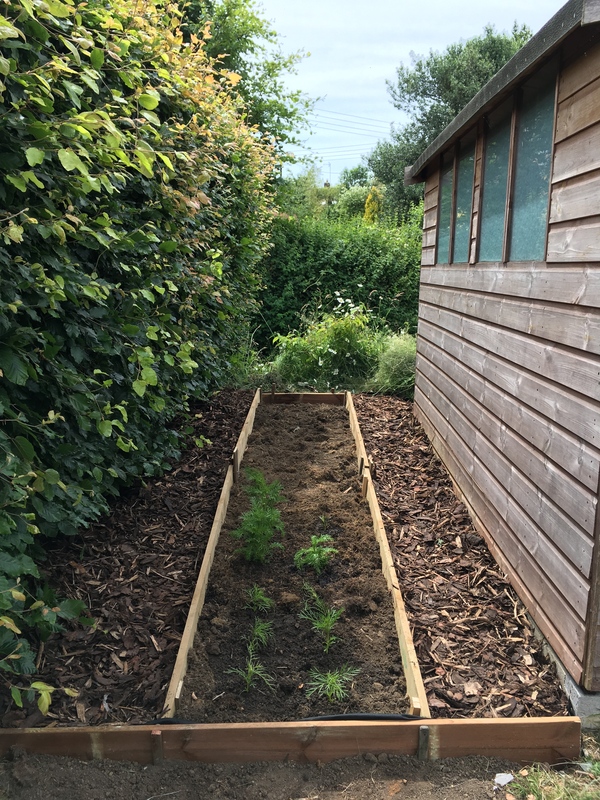 The toads have re-homed themselves somewhere, and the Dahlias, Cosmos, Sweet Peas, Asters and Dianthus in the cutting beds all look like they have had an injection of nourishment. 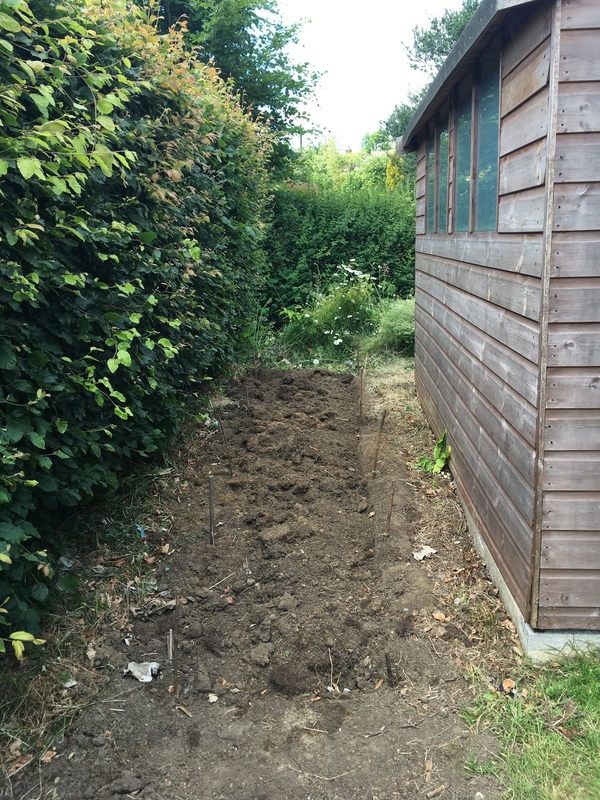 Where the stack had been, I was left with an area of unsightly bare soil. 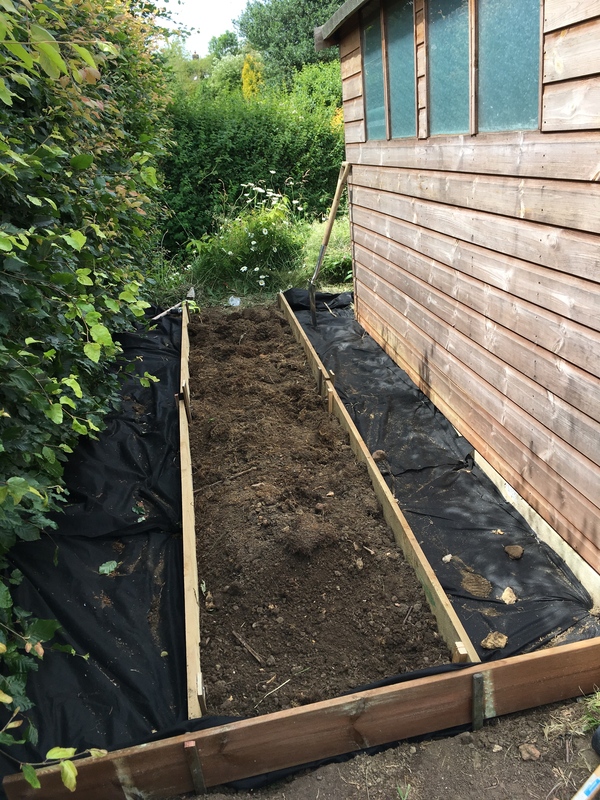 Why not use it to create a small bed for over-flow plants, experiments and sowing biennials? I already had some weed membrane, so off I went to B&Q to buy the treated wood and the bark, and – while I was at it – black paint for the shed. 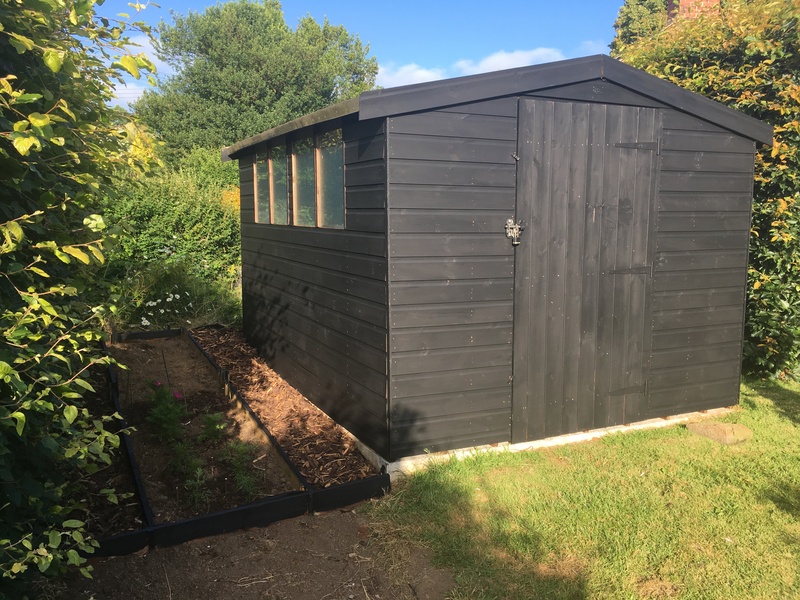 The interesting thing about painting something like a shed or barn black is how it seems to help the object “disappear”; you start to only see the green plants and blue sky, rather than the shed itself. I am thrilled with this new area.